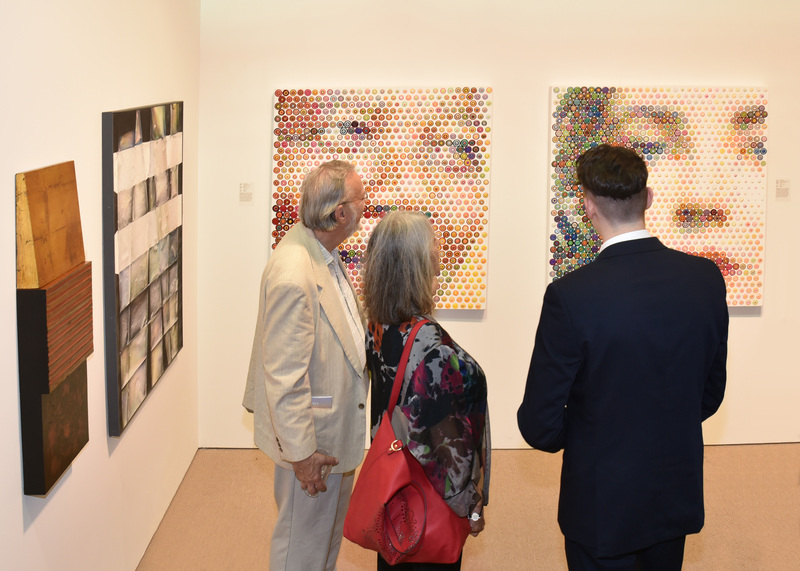 June 26, 2016 (New York, NY) – Art Hamptons concluded its 9th edition, reporting strong attendance and sales. Returning for the second time to a private estate in Bridgehampton, the Hamptons’ longest running fair demonstrated its strength as a leading modern and contemporary art fair, drawing crowds of roughly 6,500 attendees throughout the weekend. In its first year under the leadership of Urban Expositions, the 2016 edition included a significant number of returning exhibitors – with nearly 70% returning from previous years, alongside new exhibitors, including a contingent of Cuban galleries. Art Hamptons 2016closed on a high note Sunday, with the majority of exhibitors reporting robust sales, and guests enjoying the luxurious location behind the hedges on the private estate grounds ofMaria and Kenneth Fishel – amongst some of the most exclusive real estate the Hamptons has to offer. Tim Von Gal, Maria, Fishel, Melissa Fishel, Bradley Fishel and Kenneth Fishel. Photo credit: Annie Watt. Courtesy of Art Hamptons. The presence of Premier sponsor Sotheby’s International Realty was a highlight at the fair, with Regional Manager Frank Newbold taking part in the welcoming remarks and ribbon cutting ceremony prior to the First Look and VIP preview on Thursday, June 23. Adding to the luxury experience of the fair, Supporting Sponsor Porsche was onsite with a host of luxury vehicles, creating a perfect welcome for guests entering the fair, while the Roche Bobois designed VIP lounge established a dynamic setting for much of the fair’s special events and programming, including Saturday’s insightful panel, Cuban Art Today, a discussion on the societal, cultural, and economic changes in and outside of Cuba during the last couple of decades, presented by Galeria Habana, Cuba. Carole Rosenberg,President of American Friends of the Ludwig Foundation of Cuba – building cultural bridges between the U.S. and Cuba for 16 years – noted, “It was a great pleasure to be a cultural partner of Art Hamptons and work with Luis Miret, director of Galeria Habana to present a Spotlight exhibition Artchipelago, (because every artist is an island) featuring Cuban Contemporary Art. We had an excellent response and many of the works we selected found new homes in the tri-state area”. Many programming events were location-specific to Art Hampton’s East End locale, with LA-based curator Peter Frank and artist and educator Ariene Bujese leading tours of the fair; and Helen Harrison (Director of the Pollock-Krasner House and Studio), Christina Strassfield (Museum Director and Chief Curator, Guild Hall), Dawn Watson (journalist and photographer) and moderator Pat Rogers (Publisher and Managing Editor, Hamptons Art Hub) engaging in a panel discussion about the historical and contemporary draw of the Hamptons for artists. Catering to the strong Cuban contingent at the fair, Cuban Art Todaywas a highlight of the exhibitor-based programming. Carole Rosenberg, President of American Friends of the Ludwig Foundation of Cuba stated, ‘Our presentation, Cuban Art Today with artist, art historian and educator Tonel drew a large and interested crowd. We are all delighted to have had the opportunity to share the Cuban art scene with so many visitors to Art Hamptons”. Other events, including book signings, presentations by artists and galleries, and the discussion “Artful Living: Passionate Pursuit or Investment – or Both?” addressed acquiring artwork and curating a collection. Reflecting on this year’s fair, Vice President of Art Group, Urban Expeditions, Donna Davies recognized the positive and contributive place Art Hamptons has created in the Hamptons and beyond as the longest running art fair in the area. As Donna Davies notes, “Urban Expeditions was extremely happy to participate in Art Hamptons this year and pleased to note the positive reception the fair holds with both local and international exhibitors and collectors”. Please contact lucy@aopublic.com for additional information.